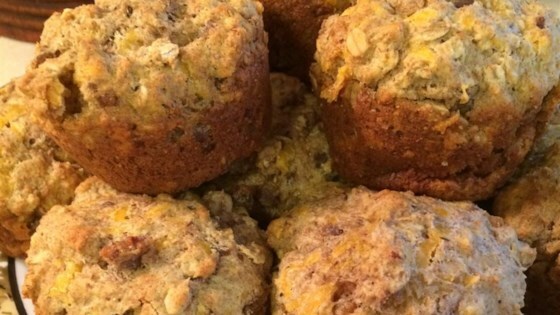 "A low fat, vegetarian and hearty muffin that is wonderful for breakfast, brunch or snacks." In a large bowl, stir together the flour, oats, baking powder, baking soda, salt, garlic powder, and onion powder. In a separate bowl, mix together the melted margarine, egg substitute, and buttermilk. Add the wet ingredients to the dry, and mix until just blended. Fold in the crumbled patties and Parmesan cheese. Spoon into the prepared muffin cups. Not overly embraced by my family. They prefer sweet muffins. This is a great base recipe. It has so many options. It is great for breakfast cause it is filling. I used cheddar and sliced ham. Thanks for the recipe! We enjoyed these. I'm putting them in the "rotation" of savory muffins that we enjoy with soup or by themselves for breakfast.